We love Blueprints because they take the guesswork out of crafting beautiful cards in quick fashion when we're short on time or inspiration. We also love them for their versatility and ability to be mixed and matched when we have the time and inspiration to create something truly unique. Our Creative Construction Challenge focuses on these attributes each month, challenging the team to both assemble a card based on one of the provided Blueprints sketches as well as design an original card combining elements from the featured Blueprints. We thought it appropriate to kick off this series by going back to the beginning and focusing on the first two Blueprints we created for you. Take a walk down memory lane with us! I have two cards to share with you today. The first one features one of the sketches from the Blueprints 1 Die-namics, and the second card features elements from both Blueprints 1 and Blueprints 2. When Blueprints 1 Die-namics first came out, I had no idea just how often I would grab for this set of dies! I tend to use the large rectangle from Blueprints 1 on most of my cards. It layers perfectly with the large rectangle in Blueprints 2. 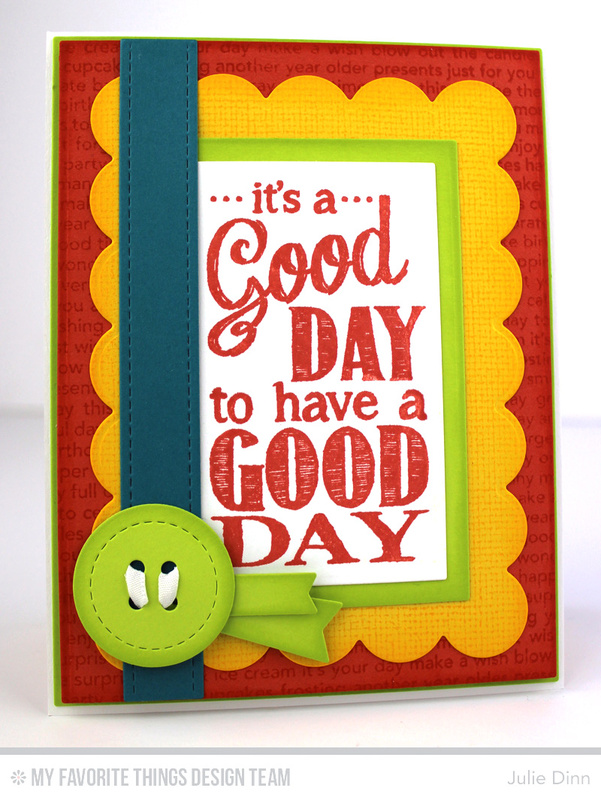 I stamped a sentiment from Chalkboard Greetings on a piece of Smooth White card stock that was die-cut with one of the small panels. 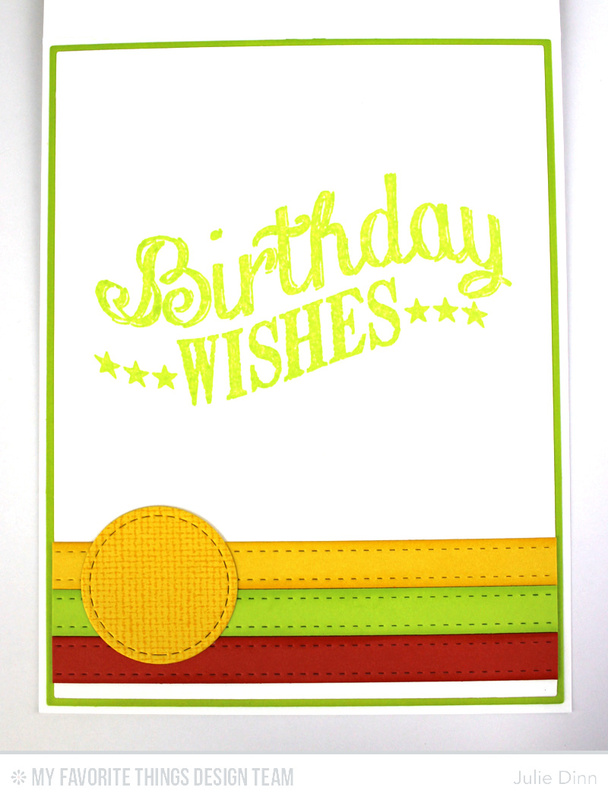 The larger Lemon Drop scalloped panel was stamped with the Linen Background, and the large Persimmon rectangle was stamped with the Happy Birthday Background. On the inside of the card, I followed the same basic sketch. 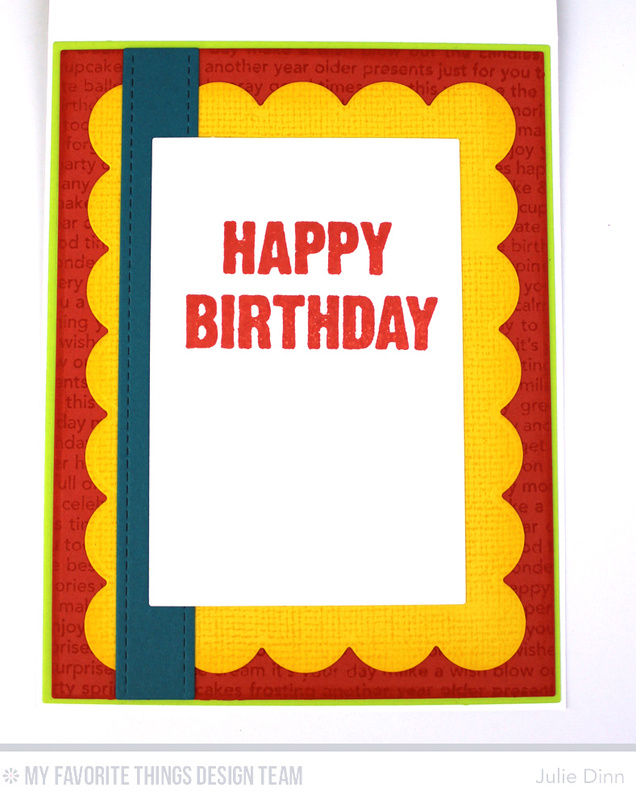 The sentiment is from the Birthday Chalkboard Greetings stamp set. My second card features elements from both Blueprints 1 and Blueprints 2. Besides the large rectangle in Blueprints 2, one of my favourite elements of this set is the thin stitched piece. It pairs up wonderfully with the slightly wider one from Blueprints 1. I also love that lovely oval. On the inside of the card, I stamped a sentiment from the Birthday Chalkboard Greetings. I finished it off with a few thin stitched strips from Blueprints 2 and a stitched circle from Blueprints 1. As you probably noticed, my cards tonight were inspired by the new Color Challenge #13. Be sure to check out the new challenge HERE. 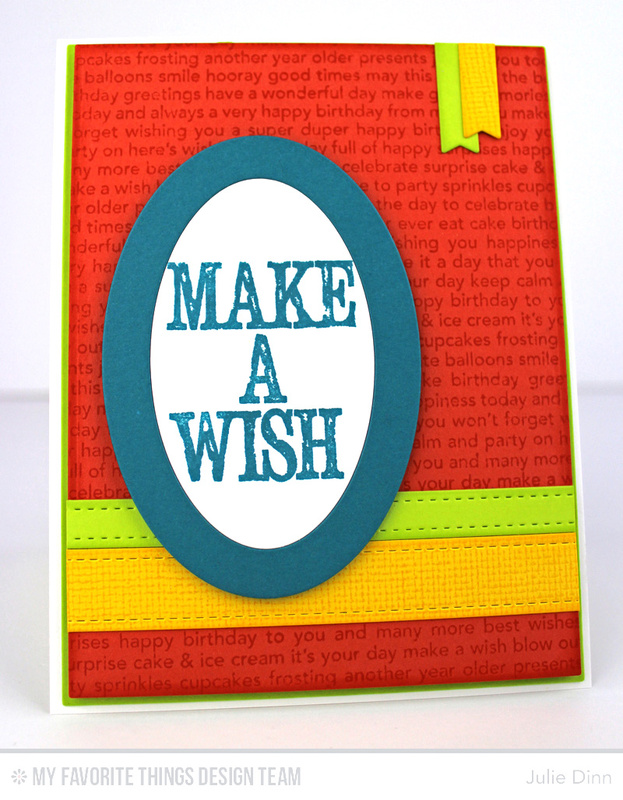 Don't forget to head on over to the MFT Blog to see all the fabulous creations the design team has to share with you today. Yummy, Yummy. I could lick the paper! LOL. Loving both blueprint sets. Payday can't come soon enough! Yay! Thanks for incorporating the color combo in your Blueprints post. I love all of the little goodies that come with Blueprints. Must. Get More. :) SO versatile. 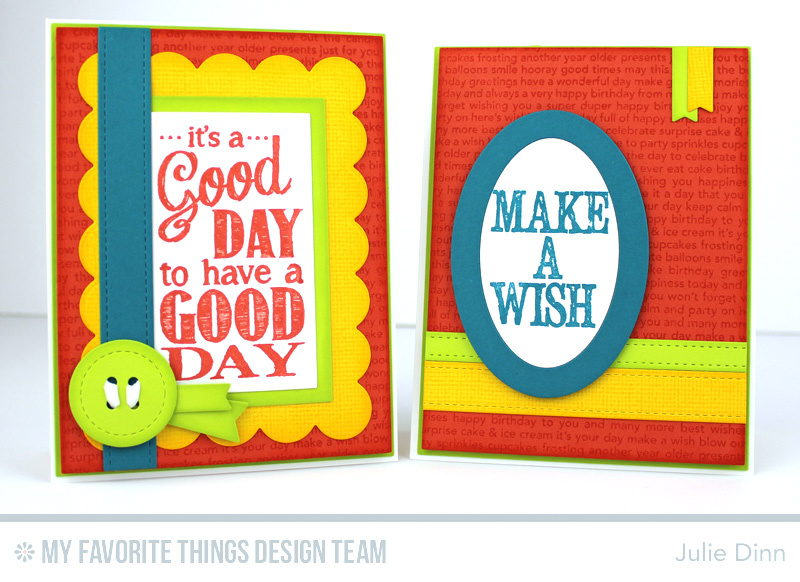 These are such bright happy cards! Five Days Until the New Release! Kicking Off 2015 with an Exciting Announcement!